Late antiquity is a period of intense change. The area of Agios Georgios in Nikiti has its own little story to tell from that era. The late antiquity period (4th-6th centuries AD) is marked by the continuous migration of people from the east and north east of the European peninsula to the lands of the Roman Empire. This phenomenon accelerated the decay and the final collapse of the western part of the Empire. At the same time, the eastern part of the Empire was reborn in what we now call Byzantium. Sithonia would have been a rather quiet area at that time. It was not near the main commercial roads and, additionally, it did not have any strategic value for the powers of the era. There were sporadic settlements, located mainly close to the sea. Their inhabitants were mostly fishermen, sailors or farmers. Archeological evidence shows that the main settlement in Nikiti was in Agios Georgios area, close to the little church that exists there today. This area seems to have been inhabited since the Hellenistic period (3rd – 2nd centuries BC). Christianity was a legal religion (religio littica) of the Roman State since the era of Constantine I (beginning of the 4th century AD) and during the reign of Theodosius I it was proclaimed as the official state religion. Therefore, the local people in the settlement of Agios Georgios should be Christians at the beginning of the 5th century AD. For those first Christians, religion was a very serious issue. At the center of their religious activities would have been the main church of the settlement. The main church of the settlement was discovered after the excavation begun in 1981 a few meters to the west of the modern little church of Agios Georgios. It is dated from the first half of the 5th century AD and this makes it one of the oldest paleochristian churches discovered in Macedonia area. It was a relatively big, three-aisled church about 48m long with wooden roof. 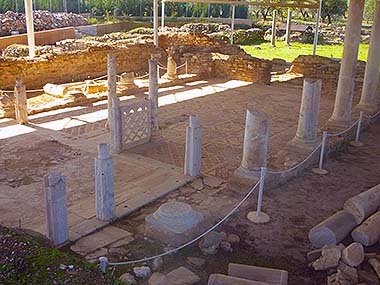 Modern archaeologists call it “Sofronios Basilica” after Sofronios, a bishop of the era whose name was found written on a stone inscription that was discovered near the church ruins. The excavations on the site produced a variety of important findings. Among them, there is an opus sectile mosaic. Opus sectile is an art technique developed in ancient Rome and spread through the Empire. Unlike normal mosaic techniques where the placement of very small uniformly-sized pieces forms a design, opus sectile pieces are much larger and can be shaped to define large parts of the design. Other important findings are a floor mosaic, the remains of wall paintings and sculptures. The floor mosaic shows two deer, a male and a female one, approaching to drink water from a pottery vessel, a typical early Christian symbolic scene. The expensive decoration of the church, as well as the findings of the nearby cemetery, allow the assumption that there were important people in the area, able to donate money in order to build the church. Moreover, an epitaph stone found in Nikiti area refers to a high official of the nearby Roman colony in Cassandra (colonia Iulia Augusta Cassandrensis). Therefore, it is safe to assume that the settlement in Agios Georgios would have commercial relations with Cassandra which was the most important town in Halkidiki during the Roman period. Note however, that the Roman colony in Cassandra would have been in decay at the 5th century AD, following the general decay of the Empire. Evidence shows that the church was destroyed by a fire during the 6th century AD. On the other hand, archeological findings in the settlement area are of the same era and not younger. During the same period, the nearby settlement in Elia area was also destroyed. Therefore it could be claimed that both the settlement and the church were destroyed after an invasion from the North. Such invasions were typical of the era. Another theory states that the church was destroyed by an earthquake.